After reading your feedback from our earlier announcement of the upcoming ED Miles loyalty program, we have modified our plans to better support our clients with Bonus Program points. Rather than have Bonus Program points expire at the launch of the ED Miles, we will allow Bonus Program points to expire one year from their earning or until March 31st, 2020, whichever comes first. This will allow all clients to use their Bonus Program points for up to one year since the points were earned. Additionally, you can get up to 30% off DCS World e-Shop purchases using your Bonus Points during the week before the launch of ED Miles. This will include all developers taking part in the Bonus Program. Following a lengthy client satisfaction review of our existing Bonus Program, we are delighted to announce the new DCS World Loyalty Program. This will replace the Bonus Program and will provide a simpler way to earn rewards and more freedom to use them! You can use ED Miles to purchase any product participating in the program, regardless if they are just released, already on sale, or as a pre-purchase! Note that ED Miles cannot be redeemed for cash or any other conversion, and a list of 3rd parties participating in the program will be provided at launch. The F-14 Tomcat developed by Heatblur Simulations will be available next week on 13 March 2019 for both the DCS World e-Shop and Steam. Purchase now and take advantage of the pre-order discount; only a few days are left! DCS: MiG-19 Farmer by RAZBAM Simulations Ready for Takeoff! In addition to the creation of new modules, maps, and campaigns, we are also quite busy updating older content. Because DCS World is such a long-lived product that is continually updated, some content will become, and look outdated as the technology advances. Two good examples of this are the very popular A-10C Warthog and Ka-50 Blackshark modules. 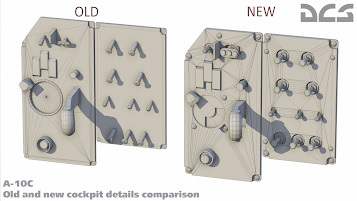 These modules are receiving significant updates that include a complete re-build of the cockpit geometry and textures. These will take advantage of deferred shading, physical based rendering, and proper VR projection in regards it the A-10C. In parallel, we also continue to update older AI units, the Su-34 Fullback being the most recent example. Over time, we will also update other older models like the C-17, Tu-95, and others. However, given the extreme detail put into each of these modules, it takes time. 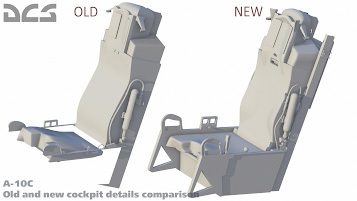 In today’s newsletter, we have a look at the new geometry that has been created for the A-10C cockpit.